For those with mobility issues who want to attend a Board of Aldermen meeting, the seven steps they have to climb to reach the front door at New Bern City Hall is just the beginning of a perilous journey. Those seven concrete steps get you barely a third of the way to the second-floor room where the board meets. I’m thinking that there are one of two thoughts that cross people’s minds when they want to attend a Board of Aldermen meeting in New Bern: What a lovely City Hall, or, how in the world am I going to climb those stairs? 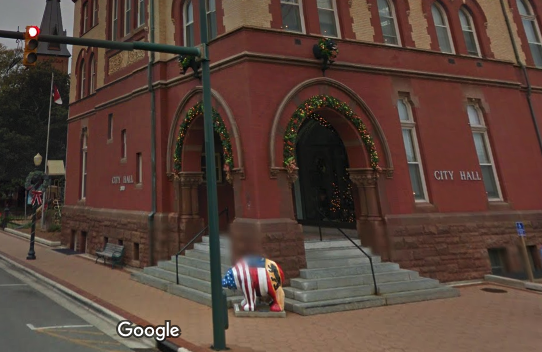 City Hall, built in 1889 as a federal courthouse and repurposed as New Bern’s center of government, is about as out-of-compliance from the American’s With Disabilities Act as Marine Boot Camp. The Board of Aldermen meet in a large room called the courtroom (because it really was a courtroom) on the second floor, reached by two flights of hardwood stairs. There is no elevator. Because of the historic nature of the building, the cost to retrofit it, and the damage a retrofit would do to the building’s structure, City Hall has been exempted from some ADA requirements and instituted workarounds to enable wheelchair-bound citizens to have access if they call in advance. City Hall has a special device with which a city worker basically drags a wheelchair-bound person up the stairs. It could make for an unsettling ride, and a lot of people with mobility issues simply avoid meetings or watch them on TV. Richard Friend, a former Rhode Island attorney, brought up the issue during the Board of Aldermen meeting on Dec. 12. He joins a chorus of people who have brought up the issue over the years. But two things irked him about that meeting. First, because it was the meeting when new aldermen were sworn in, there was a rare over-capacity situation and virtually all the public seats in the courtroom were reserved and taken up by family and friends of incoming aldermen. The other irksome thing was longer term, and that was the ADA-accessibility issue. “This meeting is being held in violation of ADA requirements,” he said. Even the phone number a handicapped person can call for assistance to reach the courtroom doesn’t count according to ADA rules, he said. He urged City Hall to fix the problem. “It’s much easier to do it voluntarily,” he said. As a rule, city staff, aldermen and the mayor don’t respond or take action during the Public Comments portion of the meeting, presumably because the comments are unexpected and unagendized and city hall officials are unprepared. (Note: the same considerations don’t apply to the “New Business” portion of meetings, but I digress.) Thus, Richard Friend’s comments received no response.